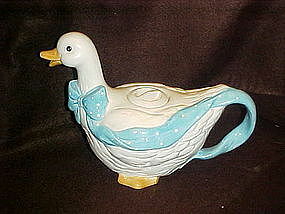 Vintage 1980's teapot that looks like the "Aunt Rhody " goose line. She is white and wears a medium blue bow with white polka dots. Measures 8" tall to the top of her head. Made of hand painted ceramic. Marked BHP NY, and do not put in dishwasher. Great condition but there is one tiny glaze chip on the lid that is barely noticeable and a mold flaw on the lid. A great addition to your collection. The teapots to this set are harder to find. Email me if you would like to see more pictures.